Investors have been clamoring for months for a bit of good news. On Thursday, they got a load of it. 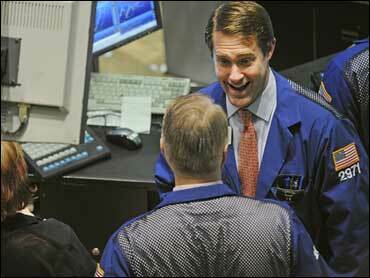 The Dow Jones industrials shot up 240 points, bringing its gains over the past three days to 622 points. It was the index's biggest three-day jump since last November. This week's rally got an extra dose of adrenaline after an accounting board told Congress Thursday it may recommend a let-up in financial reporting rules for troubled banks in three weeks. Upheaval in the banking industry has been dogging the market since 2007, and hope that banks might finally get relief in how they value their bad assets spurred a flurry of buying. "We might find that the banks are not as bad, or not bad at all, if these assets are marked differently," said Doreen Mogavero, president of the New York floor brokerage Mogavero, Lee & Co.
Better-than-expected retail sales figures also helped stocks, as did positive news from four Dow companies: Bank of America Corp., General Electric Co., General Motors Corp., and Pfizer Inc.
Bank of America's CEO told reporters his bank was profitable in January and February. Citigroup Inc. triggered this week's rally Tuesday with similar remarks. Meanwhile GE's credit rating was cut by less than expected, GM said it will not need a $2 billion loan it previously requested from the government, and Pfizer reported a successful cancer drug trial. "How all this turned around in a week, I don't know," said Scott Bleier, president of CreateCapital Advisors. "But it's certainly a better outlook than how it looked two weeks ago." No one is calling the end to the selling on Wall Street. The economic picture is too uncertain, and much of this week's rally has been driven by technical factors. One of those factors is traders' inclination to buy stock to cover "short" bets, or bets that a stock will fall. But it's been the most reassuring week in months for the stock market. The Dow Jones Wilshire 5000 index, which reflects nearly all stocks traded in America, has jumped 11.2 percent over the past three sessions. That's a paper gain of $900 billion. "There's a lot of money on the sidelines, and a lot of people who've been waiting for the turn to come," Mogavero said. "I think that probably, people will want to get some of their money in the market." The Dow rose 239.66, or 3.5 percent, to 7,170.06. The Standard & Poor's 500 index climbed 29.38, or 4.1 percent, to 750.74. The Nasdaq composite index gained 54.46, or 4 percent, to 1,426.10. The Russell 2000 index of smaller companies rose 23.82, or 6.5 percent, to 390.12. After a modest decline Monday and three days of buying, the Dow is up 8.2 percent so far for the week. The S&P 500 index is up 9.9 percent and the Nasdaq is up 10.2 percent. Advancing stocks outnumbered decliners by more than 10 to 1 on the New York Stock Exchange, where volume came to 1.81 billion shares. Not all of Thursday's data was positive. The Commerce Department said retail sales dipped by a modest 0.1 percent in February, but the Labor Department reported that first time claims for unemployment benefits rose last week to 654,000 from 639,000 the week before, more than analysts had expected. Investors are also aware that much of this week's rebound can be attributed to technical factors. The selloff that hurled the stock market to 12-year lows last week was driven largely by short-selling, when a trader bets on a stock falling by selling borrowed shares. Traders have now been covering those short bets by buying stocks, especially after the Securities and Exchange Commission said it was considering reinstating the "Uptick Rule." The rule, eliminated in 2007, aimed at curbing short-selling by only allowing it when a stock edged higher. On Thursday investors grew more optimistic about bank stocks after the chairman of the independent Financial Accounting Standards Board told the House Financial Services subcommittee on capital markets that the board "could have the guidance in three weeks" on so-called "mark-to-market" accounting. Frozen demand in the credit markets has sharply lowered the value of assets having anything to do with real estate or consumer credit  even though most of the loans themselves are still getting paid off. Those lower asset values have translated into huge losses for banks. Citigroup rose 8.4 percent, Bank of America rose 19 percent, Wells Fargo & Co. rose 17 percent, and JPMorgan Chase & Co. rose 14 percent. GM rose 17.2 percent to $2.18 after its chief financial officer said it would not need its federal loan for March. GE rose nearly 13 percent to $9.57 after Standard & Poor's downgraded the conglomerate by one notch from "AAA" due to troubles in GE's lending arm. Meanwhile, pharmaceutical stocks soared Thursday on more acquisition news and a positive drug trial at Pfizer Inc.
Pfizer said it ended a successful trial of its cancer drug Sutent early after data showed the drug met its goal of slowing the progression of pancreatic cancer. Shares of Pfizer, a Dow component, rose nearly 10 percent to $14.02. Switzerland's Roche Holding AG agreed to buy the rest of Genentech Inc. for $46.8 billion, while Gilead Sciences Inc. agreed to buy CV Therapeutics Inc. for $1.4 billion. Earlier this week, drugmakers Merck and Schering-Plough agreed to merge in a $41 billion deal. Government bond prices rose, driving the yield on the 10-year Treasury note down to 2.86 percent from 2.91 percent late Wednesday. The dollar strengthened against other major currencies, gold prices gained, and crude oil surged $4.70 to $47.03 a barrel on the New York Mercantile Exchange. Overseas markets were mixed. Britain's FTSE 100 rose 0.5 percent, Germany's DAX index rose 1.1 percent, and France's CAC-40 rose 0.8 percent. Japan's Nikkei stock average dropped 2.4 percent, while Hong Kong's Hang Seng index rose 0.6 percent.